11:30 PM. 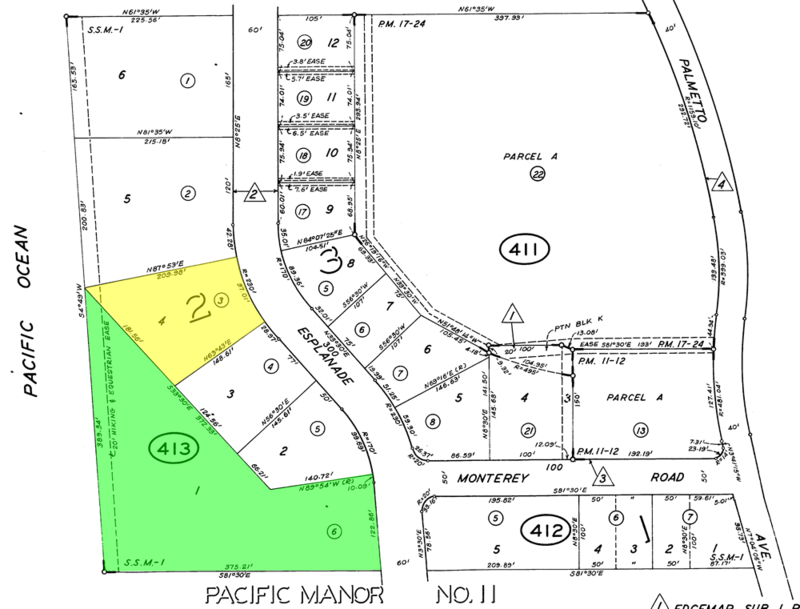 San Mateo County Times Pacifica Evacuees may be displaced for year or more. The further reduction of the cliff tops behind 330 had been mentioned in other stories but in this one it is a central factor in renewed concerns for the habitability of 330 Esplanade. Apparently so much cliff has dropped away that you can see straight down onto the beach in places. This much loss of the cliff top invalidates existing plans for walls and rock, and may make the entire remediation project too expensive. 11:15 PM. 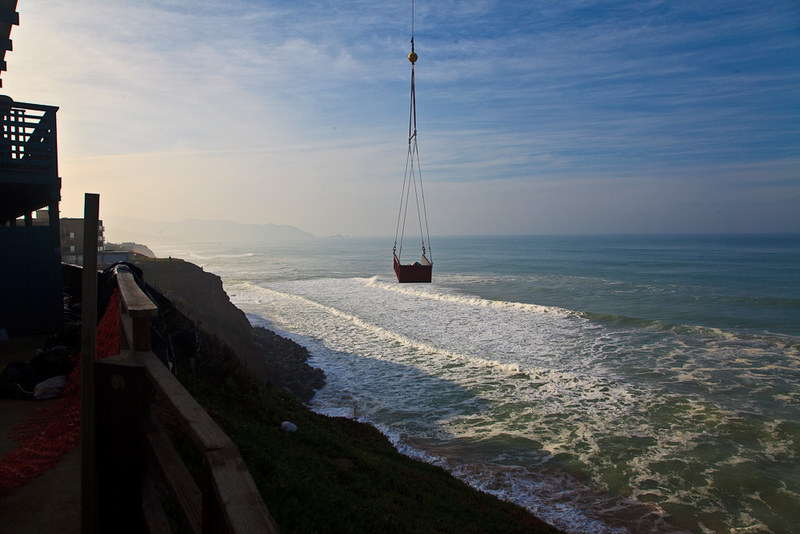 KGO-TV 7 Crews make progress on Pacifica cliff. Rush to get the rip rap in place before the next series of storms comes in next week. Seems to be succeeding. The engineer called the rip rap “the rock butress” – something to investigate. 4:00 PM. KGO 7. 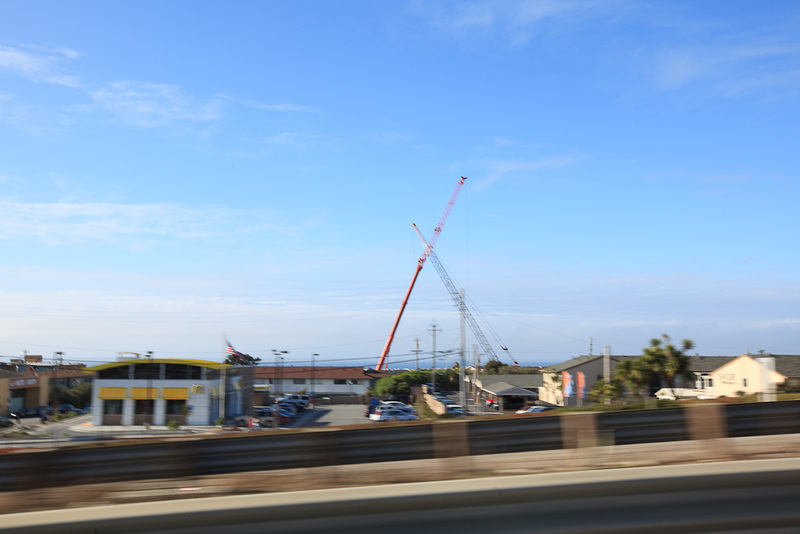 In a story released at about 1:00 this afternoon, KGO reported Crews complete road down crumbling Pacifica cliff and that one of the cranes up on Esplanade will depart. Good picture with the story. While the wind was blowing hard enough to stop work this road seemed essential but by now, according to the story, about 80% of the work is done. If true, it’s hard to see how the road saves any work. 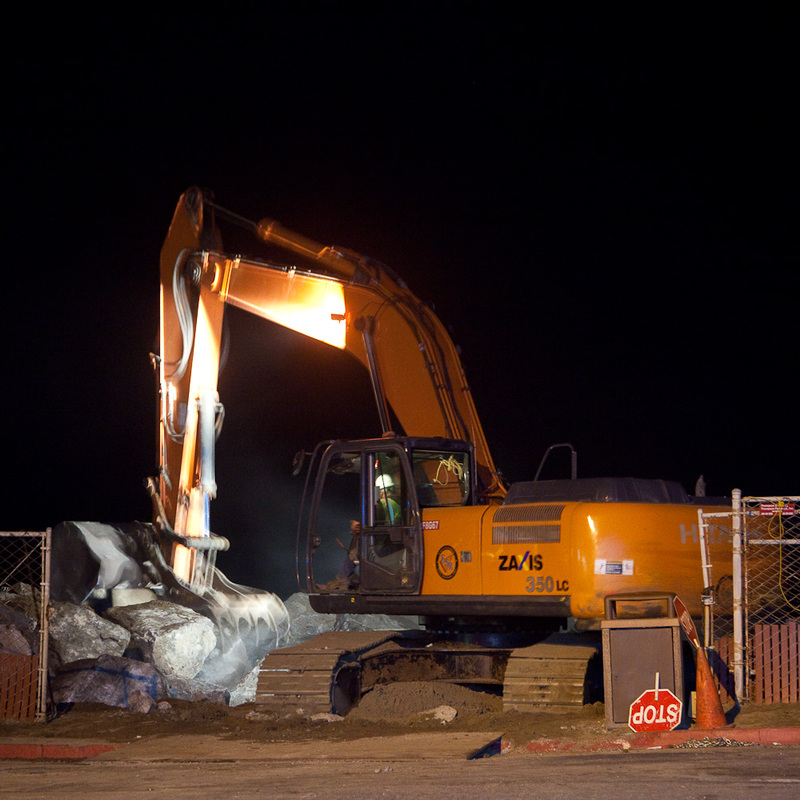 Just found this days-old item in the KGO 7 “live video” archive: Crews work into the night to place rocks. 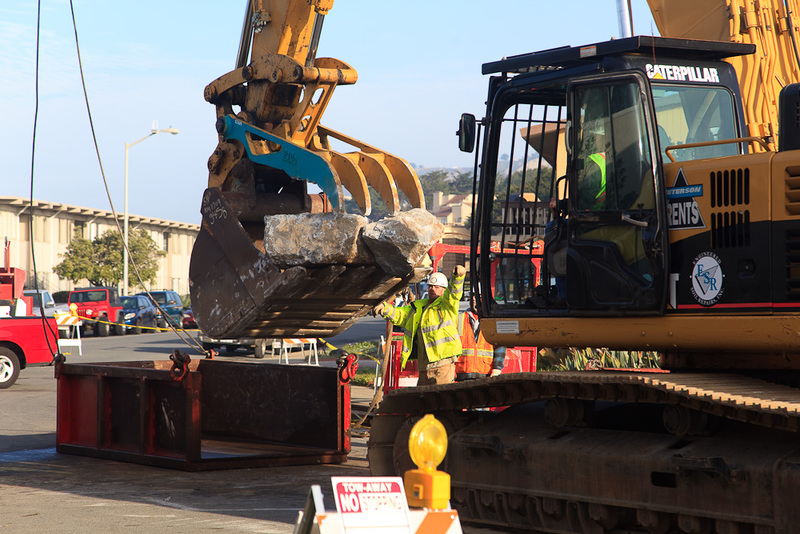 Video shows the process of placing a rock on the beach, then the crane lifting the rock box back to Esplanade for an excavator to load another rock. 6:30 PM. Windy this morning, crews not working the cranes. 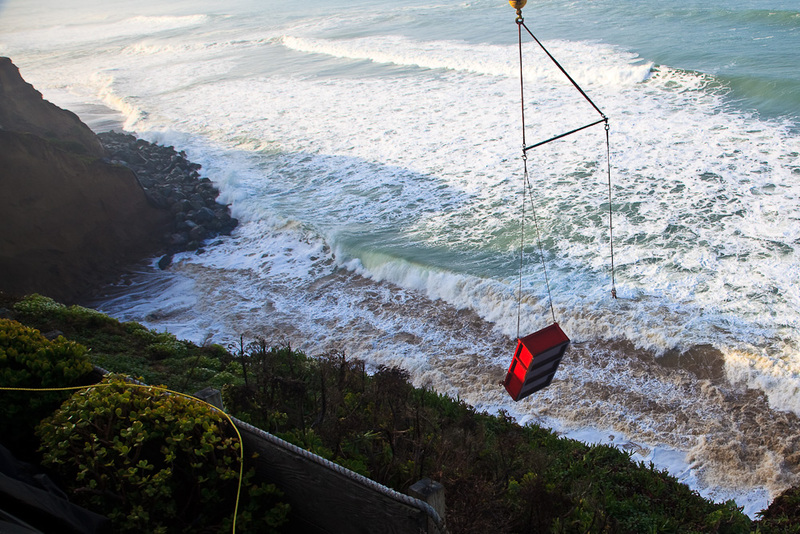 KGO-TV 7 Winds slow crews working on Pacifica cliff. Video shows good progress on finishing the access road down from Manor and Esplanade, and the weather makes it clear why the road is needed. 11:30 PM. 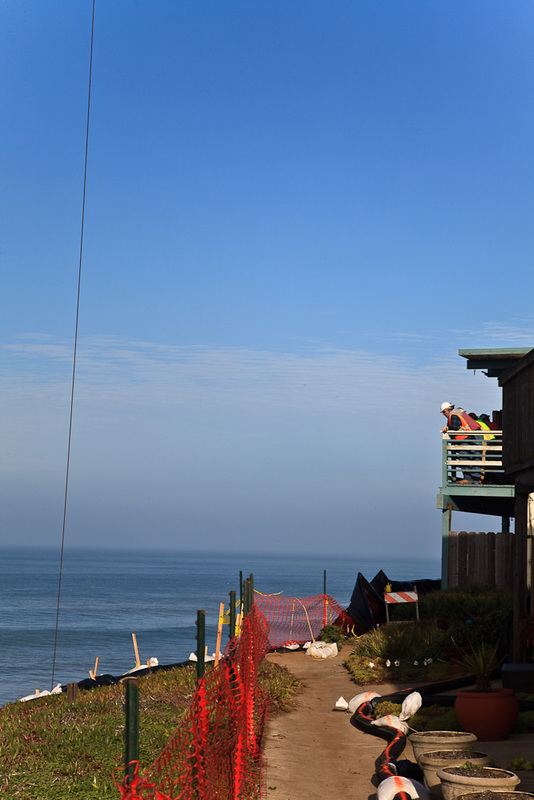 KGO ABC-7 Crews in Pacifica race to protect crumbling cliffs. Interesting quote at 1 min 52 sec: “The property lines along this stretch of oceanfront show the boundary are complicated by the fact that the owners of the apartment complex at 360 Esplanade actually own a good deal of the beach in front of three neighboring apartments to the north.” (Presumably 350, 340 and 330) “Last week when waves were slamming onto the cliffs all the property owners agreed that emergency measures were needed but now that the immediate crisis has passed the old dispute of who should pay for what has resurfaced. Graphic incorrect, showed road cut down through the “dog park” north of 320. The video itself showed a bulldozer at work south of the site, near the Post Office and Chit Chat Cafe. 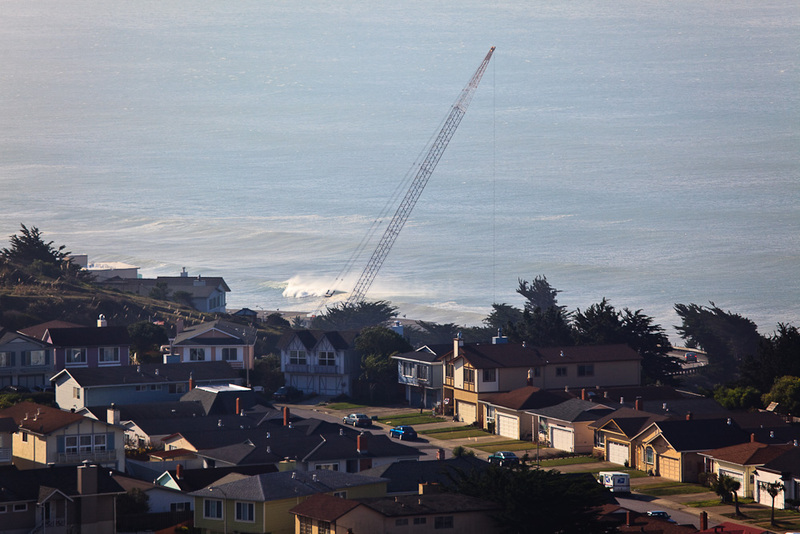 From local blog Fix Pacifica, Reprint from January: Pacifica Apartment Dwellers Fear for Safety Due to Cliff Erosion, provides a sense of the local politics and overall sensitivity of the issues around the environment, development and budgets. 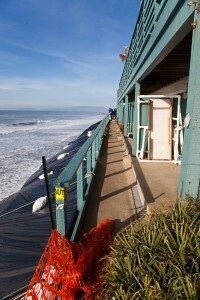 Pacifica Riptide, also in January, Cliffhanger: La Esplanade Apartments at Risk? Interesting discussion in the comments. 6:50 PM. 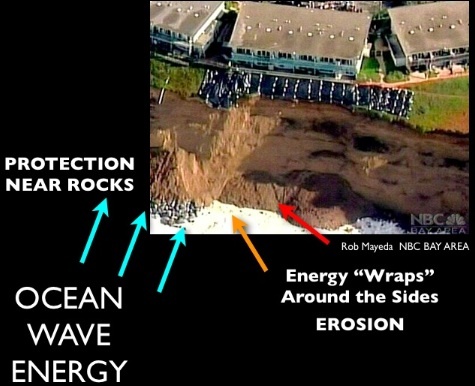 Lots to digest in a somewhat chaotic item from NBC 11, KNTV on NBCBayArea.Com: Pacifica Residents Warned of Cliff Two Years Ago. More later. 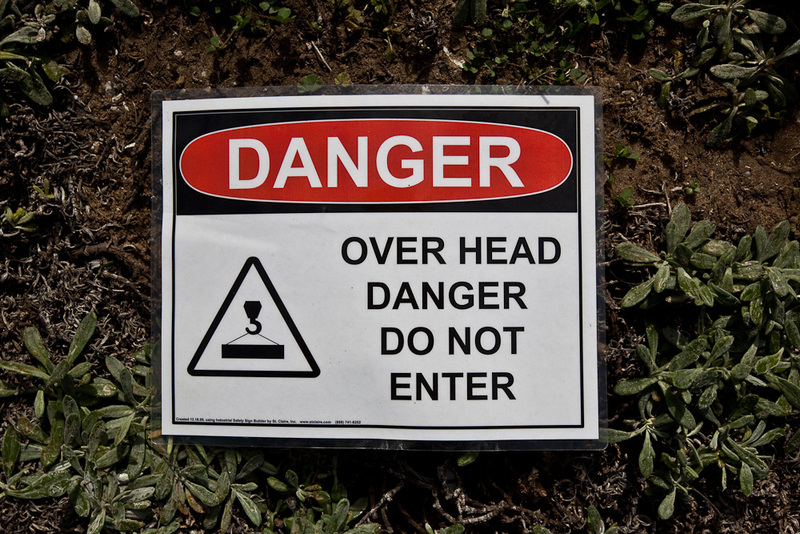 The main newsworthy item in this piece appeared to be the second paragraph, “Owners of the buildings on Esplanade Drive say they had applied for a permit to build a barrier at the base of the decaying bluff as early as 2007. But a neighboring building owner’s complaint prevented the wall from being built until last Thursday.” What makes this piece seem chaotic to me was the attempt to tie several strands of history and acrimony together in too short a form. The links on that article helped me understand a little more, but I’m becoming convinced that no more than a small handful of people really know the whole story or history. A vast number of people, on the other hand, are ready with blame and recriminations. Understandable and hopefully nothing I or the people I care about will need to engage. 6:45 PM. KRON-4 TV has a lengthy report in their home page video player titled “Bad Weather Monday Doesn’t Slow Pacifica Repair Efforts”. Story asserts that work will not be done until after Christmas – first time I’d heard that. No indication of actual progress made. No clear idea of whether residents will be allowed to return after the rip rap is in place. 6:22 PM. 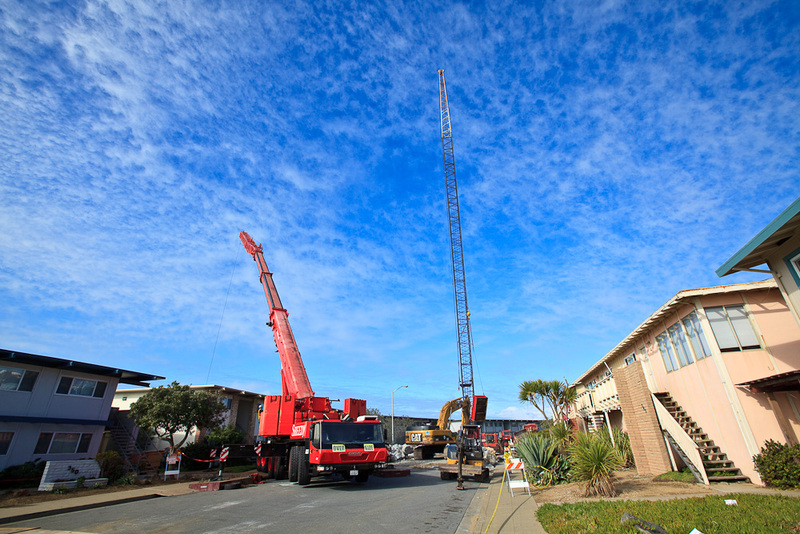 San Mateo Times reports of lowered expectations for rapid return for ex-residents of 330 Esplanade but fails to provide any real news about the progress made so far. 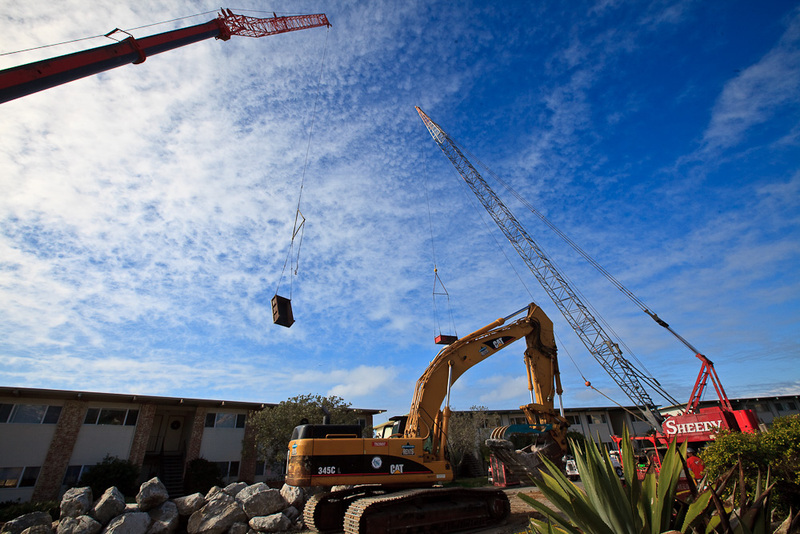 In addition, Ruby Papp, the California Coastal Commission supervisor for our area said that in March of 2009 the Commission did grant the building owner the necessary permit for cliff construction or repairs. The building owner had previously denied that they had gotten the permit. This article indicated that construction / repairs did not take place due to a disagreement with a neighboring property owner over access. 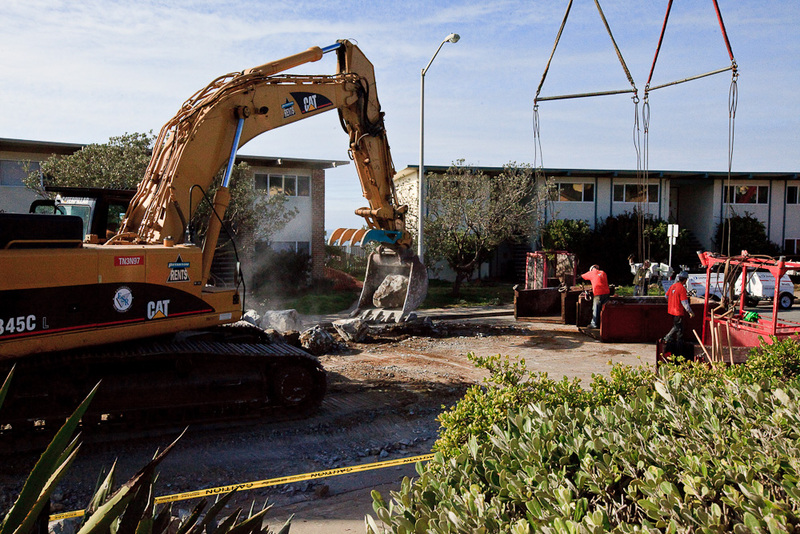 See the full article on InsideBayArea.com: Cliff now stable, but Pacifica apartments still unsafe. 12:53 PM. 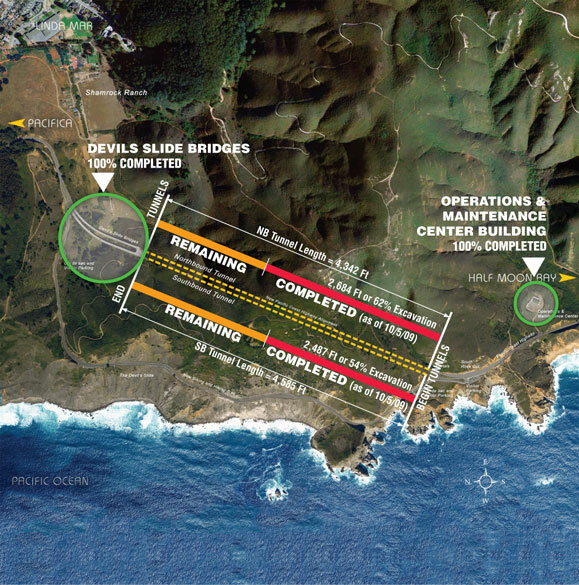 CBS 5 Pacifica Cliff-Shoring Operation Delayed. Confirmed work to get equipment down on the beach. 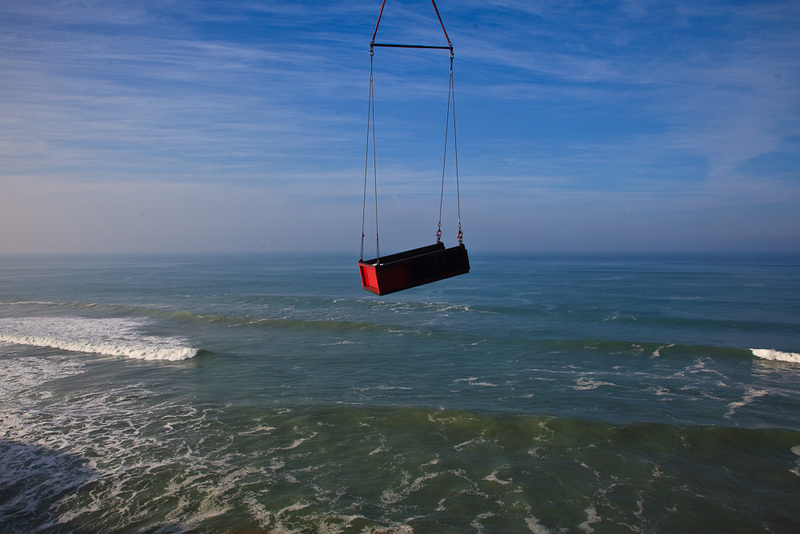 New information: trucks to carry rock directly to the beach, much faster than the cranes; rip rap (rock) placed in previous years (?) in the way, as I said there’s no room down there. Weird detail… some sort of additional wall or barrier to protect the working equipment from waves. See the video for yourself. 12:40 PM. Posted a number of my pictures: Excavator at Rock Pile – Photo Gallery. See the Fickr set for all of the images. 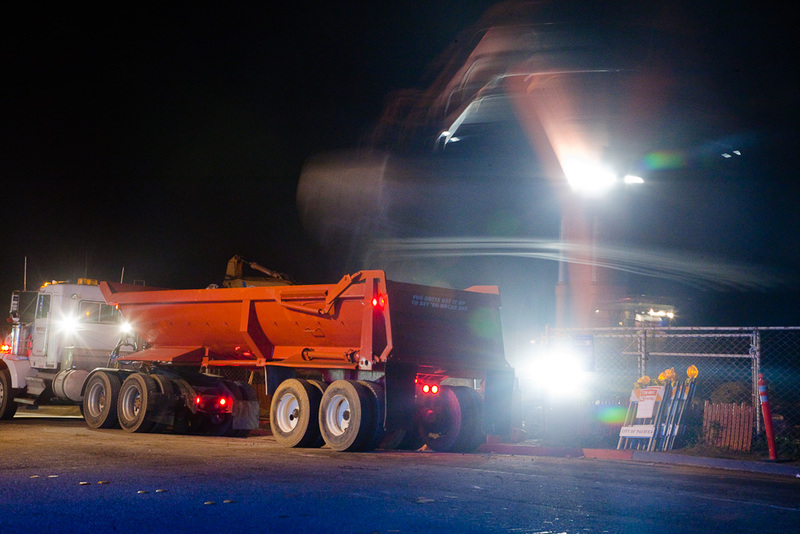 One of the excavators moving rock broke down last night. Not surprising considering how much rock they’re moving, and how heavy. The KGO news video says they’ll have another soon (perhaps already have it as of now 10:30 AM). 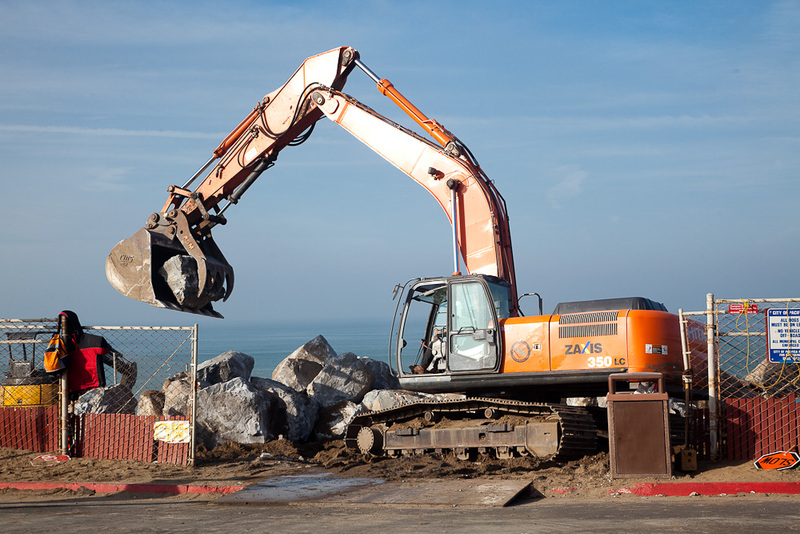 Also from the KGO report, news that a road down to the beach will be rebuilt to allow equipment, probably excavators, to position rock more precisely and quickly. The video doesn’t say where the access “road” will be, but based on what I’ve seen it has to be going down from beside the intersection of Esplanade Ave and Manor Drive, next to the Chit Chat Cafe and the Post Office (see location in Google Maps). There is no beach down there at high tide, or rather I should say it’s awash, so the equipment can be down there for the middle part of each low tide twice a day. 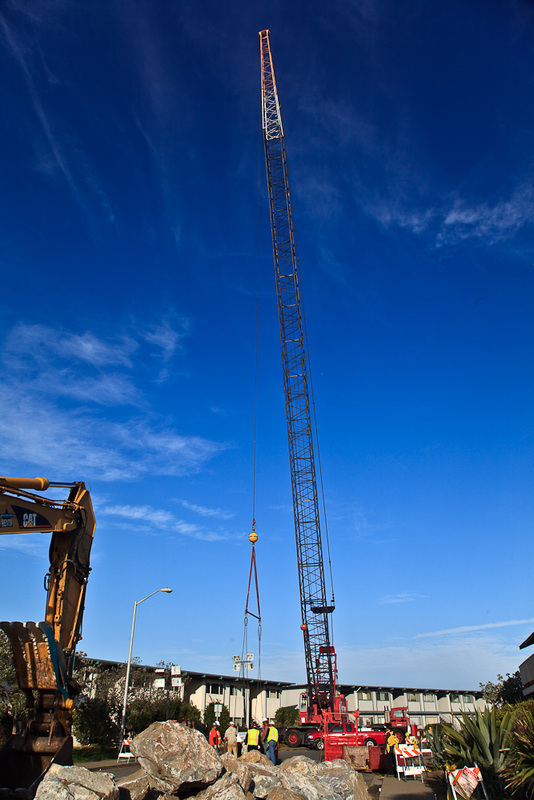 Watching the second crane hoisting boulders from the street, over 330 Esplanade Ave, and down to the base of the sea cliff, I noticed that as it was placing rock at the beach it was extended directly over the occupied 340 Esplanade apartment building. I guess this calculated risk was acceptable since the operators knew the weight of each load as they lifted it. Still it was creepy when they stopped a load mid-lift, high above the beach, and returned it to the street to remove a boulder. 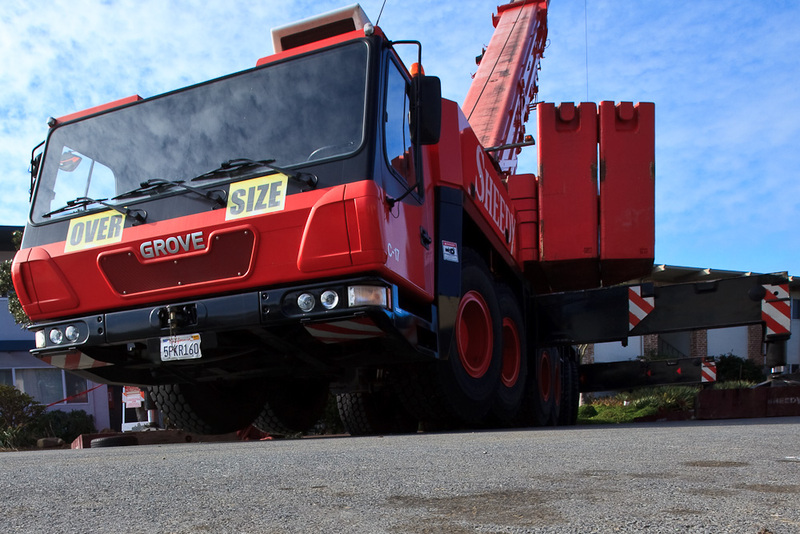 A fellow spectator reminded me of the crane collapse in Santa Rosa back on November 18th: ABC (KGO 7) report 50-ton crane slams into Santa Rosa home. 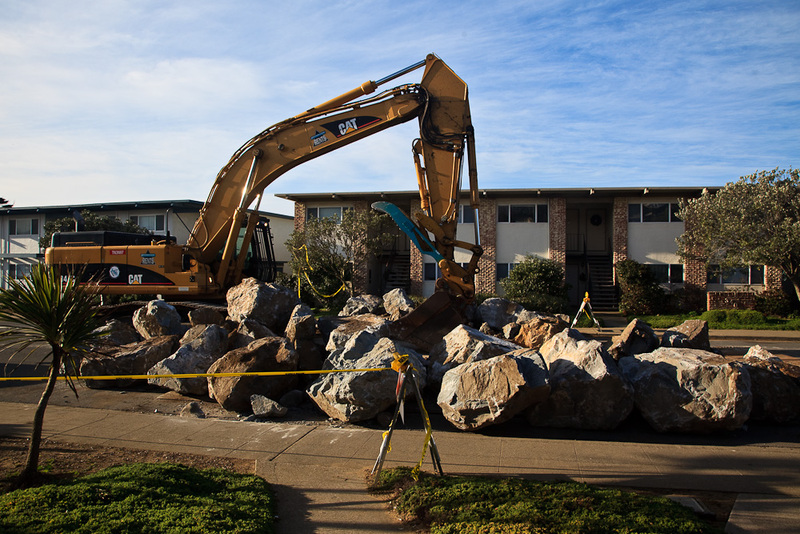 This post contains the chronology of events since the evacuation of 330 Esplanade, Pacifica due to sea-cliff erosion began at about 7:30 AM December 17, 2009. Police were on the scene and a high surf advisory coincided with high tide, adding to concerns.I update this post with new items at the top, and create and link to new posts as needed. Scroll down to read the chronology, and click the MORE link for the full story and links to additional detail and photos. You can see all of my Esplanade-related posts on one page here: Esplanade. 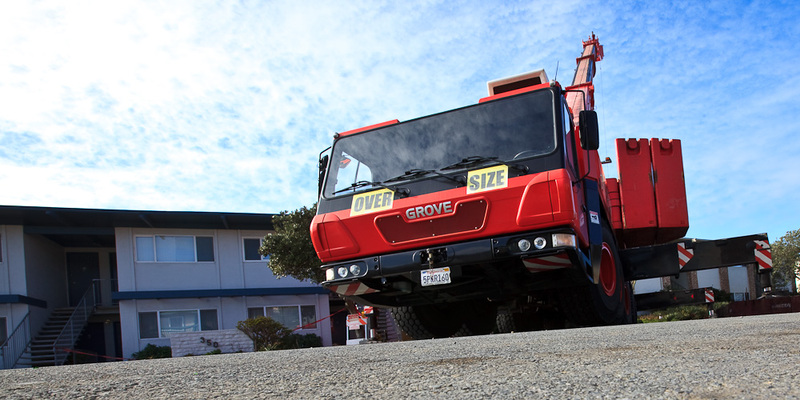 See all of my pictures on Flickr Evacuations at 330 Esplanade, Pacifica CA. June 2011 Esplanade Update: 340, 330, 320, June 24, 2011. 340 Esplanade patio damage, 330 Esplanade to be abandoned, 320 Esplanade apparent neglect. 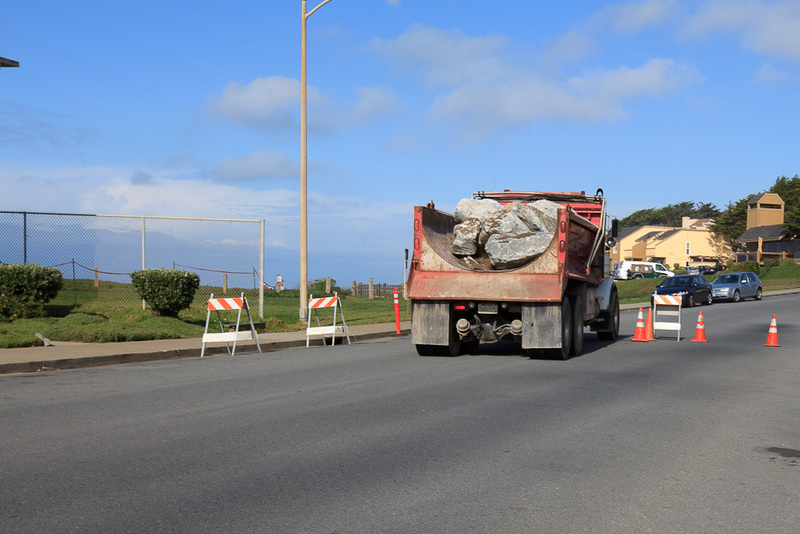 Seawall Armor Below Land’s End (Photos) – a glimpse at the work below Land’s End on Esplanade Ave. So far work on a cement and soil-nail sea wall has resulted in disconnected rectangular constructions. I image they must be connected and extended up to the 30′ surf line. 340 Esplanade May Be At Risk – New photos show that erosion continued behind the buildings along Esplanade Ave in Pacifica, CA. Most notable, and downright scary, is a nearly unsupported patio behind 340 Esplanade. A ranch owner has run afoul of city, state and federal laws by building several horse structures without a permit and endangering local wildlife habitat by illegally filling a creek with construction debris, according to officials. Tong continues to believe that he should not have to apply for permits for activities like road maintenance and grading, which he says are part of the everyday duties of managing a ranch. 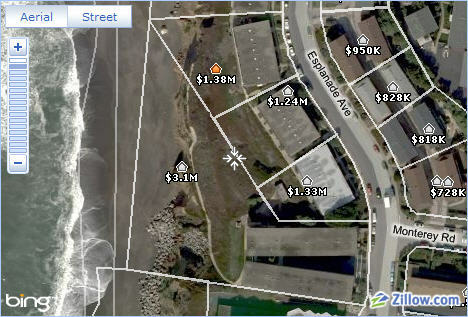 Thanks to Pacifica Riptide (Millwood Ranch Busted: Filled Creek with Debris).